Andes Website - Skiing in the mountains of Chile. This ski-mountaineering trip, which we pioneered eighteen years ago in August 1999, takes us to the country with the best ski mountaineering in the Andes. 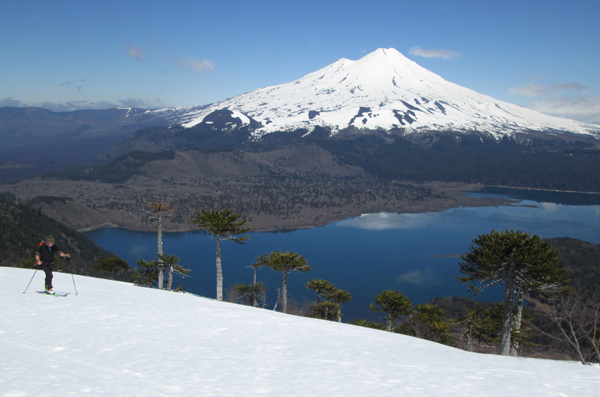 The expedition will be largely based in the Chilean Lakes District where we will make ski mountaineering ascents of many of the volcanoes including the spectacularly active Volcan Villarrica 2847m. We also plan to attempt ascents of Antuco 2985m, Lonquimay 2865m, Volcan Chillan 3186m, Llaima 3125m and Sierra Nevada 2554m It is unlikely that we will be successful on all of these peaks unless we have really superb weather. (However with a strong group and exceptional weather we made 8 summits in 2001, and in 2014 with good weather we made all but one of them). We had less good weather on our 2016 trip but still summitted Villarrica, Casablanca, Lonquimay and got big ski descents on Chillan and Sierra Nevada. On days of bad weather we may ski some of the downhill resorts in the south, such as those on Volcan Chillan and Villarrica, if they are still open. Unlike many of or itineraries this trip is entirely based around hotel or chalet style accommodation, with no camping. We keep the itinerary very flexible to make the best use of weather and snow conditions. To do this we use a hired vehicle for transport and normally only have the next 2 or 3 nights accommodation booked. Expedition members should be strong parallel or telemark skiers (skiing black runs easily). Previous ski-mountaineering and/or Alpine mountaineering experience is very useful for this itinerary as well as a very good standard of fitness for long mountain days. If you don't have this experience or level of fitness then our Patagonian Ski Explorer, with mostly shorter and easier ski-mountaineering days and a few more piste skiing options, will be more suitable for you. A beautiful day in October 2014, skiing along the ridge towards the peak of Sierra Nevada, with Volcan Llaima in the background. 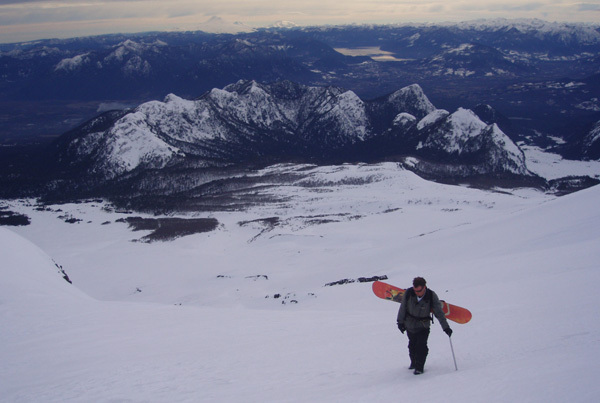 Days 4-12 Ski ascents in southern Chile. Flexible itinerary to make best use of good weather days to ski and poor weather days to drive. Target peaks include Villarrica, Antuco, Lonquimay, Llaima and/or Sierra Nevada and Chillan. We'll fly out to Santiago and we may have a short time in the city at the beginning and end of the trip. At the start of the trip we'll make a day visit to the nearby ski resort of Valle Nevado (if it is still open!). This resort is of an international standard, with over 20 runs and plenty of advanced skiing. The skiing is generally between 2800 and 3800m above sea level. The resorts by Santiago are normally open till early or mid-October, depending on winter snow cover. 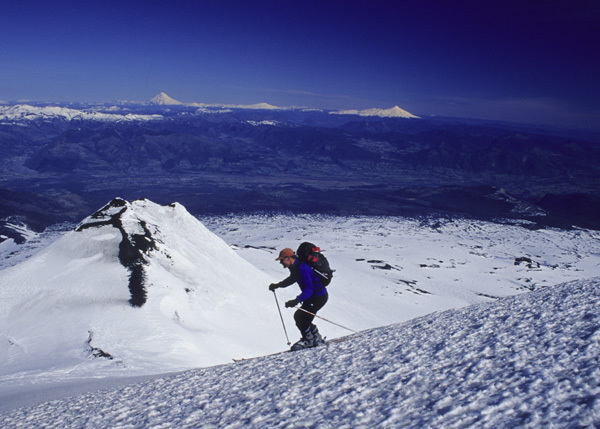 Skiing off the summit of Volcan Llaima, on our second trip to Chile, way back in October 2001. The main part of the expedition will be based in the Chilean Lakes District. This area, a days drive south of Santiago, has one of the largest concentrations of national parks in South America and is one of the most scenic areas of the world. The scenery is an unusual and beautiful mixture of volcanic and glacial; deep blue lakes, green pastures, forest covered hills and ice capped volcanoes. Both the Chileans and the Argentines have set up National Parks to preserve this scenic grandeur. While in this area we will be based in a mixture of valley hotels or chalets but will aim to get out and ski the hills on most days, making ascents of the big volcanoes mixed with shorter days skiing through the beautiful forests. We'll keep the itinerary super-flexible to make the most of the best weather days. Climbing Volcan Villarrica prior to snowboarding back down, August 2007. 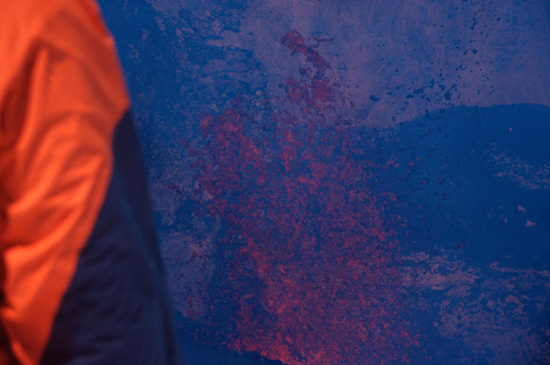 The ascent of Volcan Villarrica will probably be one of the most memorable days of this expedition. It is a highly active volcano which last erupted in 2015. From the edge of the crater it is possible to look down into a lake of red hot lava, or see stones hurled up the walls of the crater. You also get to breathe in some of the world's worst smelling gas! The activity does vary from year to year but is never disappointing. The mountain is 2840m high, and an easy one day ascent from the ski resort by the north slopes. Volcan Llaima 3125m is a beautiful symmetrical cone which rises above the monkey puzzle forests of the Conguillio National Park. The ascent by the northern flanks will take only one long day from a track near the snow line. The volcano is active and emits steam and ash from time to time. 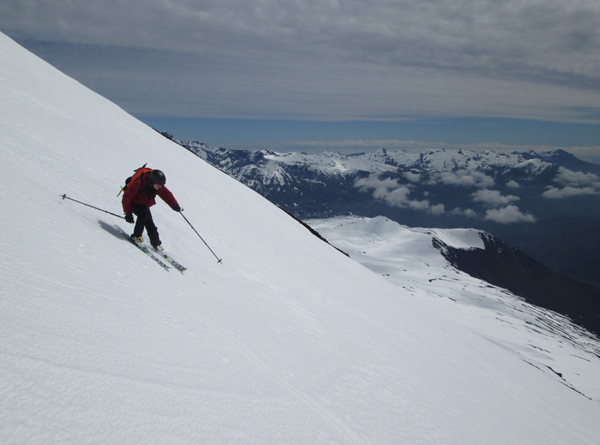 We've had superb 1800m ski descents off Llaima every year so far. Sierra Nevada is a neighbouring peak of 2554m, a great ski ascent once you have walked through the bamboo forest to get to the snow. There are superb views of monkey puzzle trees from a section of ridge on the ascent. Volcan Lonquimay is another superb ski ascent, a shorter day, starting from the road end by some beautiful monkey puzzle forest. The peak is 2865m high but it is usually only possible to ski to about 2600m, followed by a walk up a narrow ridge. Another beautiful conical volcano, Volcan Antuco is another relatively short day out on skis. There are excellent scenic views of the Laguna del Laja from the summit, and a tiny (and usually quite warm!) crater. Finally we'll also ski Volcan Chillan, a 3186m high active volcano that erupted the day after we skiied it in October 2016. It sits above the ski-resort of Nevados de Chillan and is another peak that will be a single day ascent, using the lifts to give us some extra height (again if they are open). ......the view to Volcan Lonquimay during an ascent of Cautin, superb weather and snow conditions in August 2012. Chile generally has very stable winter weather more like the continental USA than the European Alps, but there is obviously a chance of some bad weather and snowstorms while we're there. Windy days can also be a problem in the Andes, but by late September and early October warm sunny days are also very common. 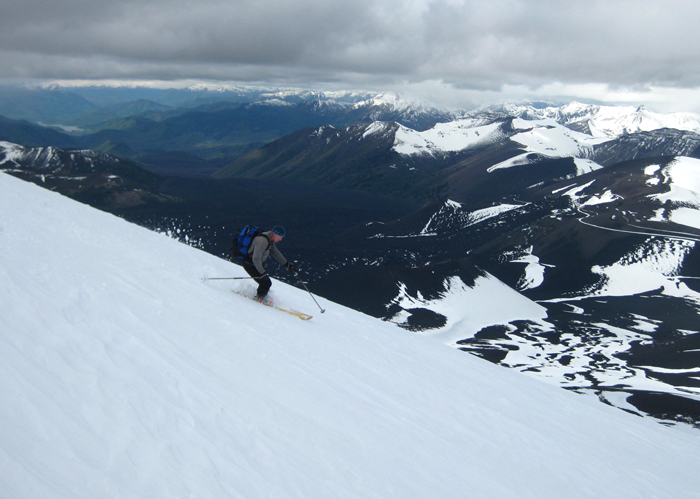 Skiing down Volcan Antuco, October 2014. Expedition members should be fit and competent telemark or alpine skiers preferably with previous ski-mountaineering experience. It's also possible to use a snowboard or splitboard on this trip but please phone or email us to discuss this first. The minimum skiing or boarding ability necessary is being able to descend black runs in good control at a reasonable speed. Winter skills including use of an ice axe and crampons may be needed for the ascents but since we will be on easy snow slopes any customers without such skills can be instructed during the expedition. It is not essential to have these skills before joining the expedition. A good standard of ski touring fitness is essential for this expedition as many of the single day ascents are relatively long. All clients must be insured for medical costs and repatriation in an emergency. We recommend having insurance for baggage, personal liability and cancellation as well. If you would like advice on insurance please ask. Please bring an extra copy of your insurance certificate on the expedition for the leader. Chile is one of the most well developed countries in South America. You would be unlucky to get an upset stomach or diarrhoea. Vaccinations for tetanus, typhoid and polio are recommended. The country is very safe and relaxing to travel in; theft and muggings are as unlikely as they are in most British cities. Our expeditions are designed to be small and flexible. The expedition will be co-ordinated, organised and lead by us, but we will consult and involve the expedition members when planning the details of the trip. Please note however that the leaders decision is final where the safety of the group or any member is in jeopardy; for example where retreat or diversion is necessary due to illness or bad weather. The minimum number of customers we need to run this trip is three. The maximum size will be five customers plus leader. 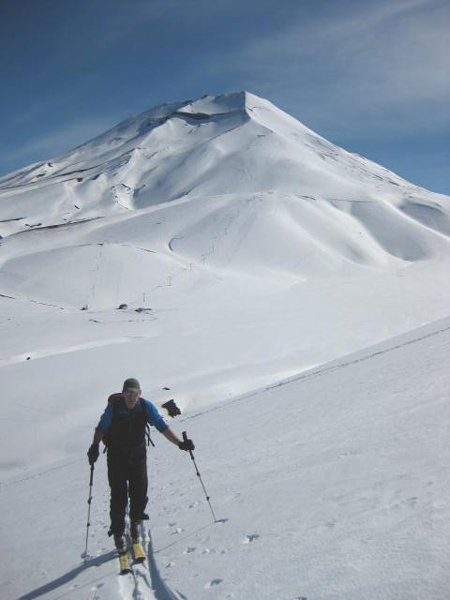 This trip will be led by John Biggar, who holds the MIC mountaineering award, has completed his BASI level 1 and has over 300 days ski-touring experience in the Alps, Andes, Caucasus, North America, NZ and the Pamirs. Lava erupts from the crater of Volcan Villarrica, October 2003. Our price does NOT INCLUDE - your flights, your insurance, your hotel/hostel accommodation, your meals taken at cafes and restaurants, your share of communal travel costs (e.g 4x4 rental, mule costs), your personal climbing, skiing and camping equipment (i.e. used by you alone, such as sleeping bag, ice-axe, crampons), permits or peak fees payable by yourself. This is an adventurous trip and all clients will be exposed to an element of risk by taking part in this itinerary. While we take all reasonable precautions to reduce risk it is neither possible nor desirable to completely eliminate these additional risks. Some of these hazards carry the risk of serious injury or death. It is important that you understand the risks involved before signing our booking form. We have identified the following areas as the principal additional risks of this itinerary. This is not a fully inclusive list - please ask if you would like to see a more detailed risk assessment before booking. Driving, hotels and general safety : In Chile driving, hotel fire safety and general safety standards are not as high as in Europe. Mountain Hazards : There is a considerable risk of injury while skiing and using lift machinery. Pistes are not as well marked as in the US or Europe. Off-piste there may be considerable danger of avalanches, as well as other mountain dangers arising from bad weather, difficult navigation and minor slips and falls on steep and/or icy terrain. Remoteness : You will be up to a half days walk/ski from medical help for some of the time. A helicopter rescue is not likely. Skiing on Volcan Lonquimay, October 2016 expedition.